My Bar Access discussions are only viewable by MBA members. Login to My Bar Access to see MBA members-only content or post a discussion. Visit http://www.massbar.org/join to become an MBA member. My Bar Access resource library entries are only viewable by MBA members. Login to My Bar Access to see MBA members-only content or share a file. Visit http://www.massbar.org/join to become an MBA member. 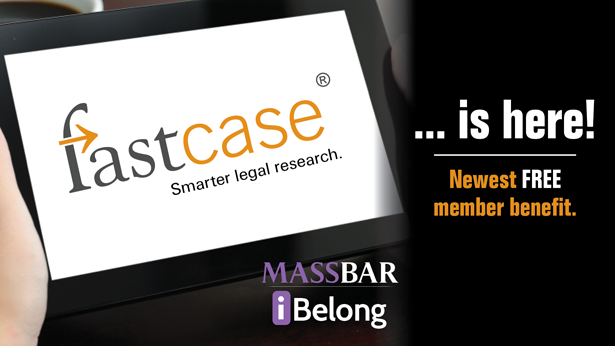 MBA members now have FREE, unlimited access to Fastcase -- one of the nation's most popular legal research services. Take advantage of several of Fastcase's unique features, including data visualization, mobile sync, batch printing, annotated statutes and more. Fastcase also has the most popular mobile app among lawyers, according to the ABA's annual Tech Survey. Click here to learn more and log in.